Having started my number crunching regarding the survey, I have realised that it wouldn’t possible for me to put all the analysis into one post … I don’t know about you, but I don’t really think a post that spans multiple pages is a good idea. So, I’m going to talk about it for alternate weeks for about a month or so. In other words, this is the first post in a (most probably) 3 (but possibly 4) part series. So, (within the uniform section) the first question was about whether or not people had worn uniforms. The result can be seen in one of these lovely purple pie charts. 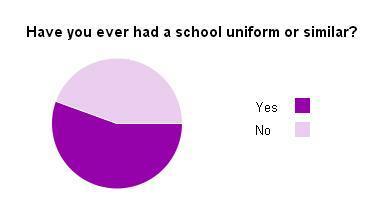 It turns out that it was a pretty even spilt, with 44% of the respondents never having had a school uniform. To me, that’s quite odd. I’ve had 3 different school uniforms, 2 of which I thought were okay – and the final one I absolutely hated. Mostly because it was pink. I only stopped wearing uniforms about a year ago, because sixth form is different and (to me at least) more liberal and more “grown up”. But I Digress. The next question was about how formal peoples uniforms were (or are). Because I thought it would be the easiest way of doing things, this was on a scale of 1 to 10. And none of the results were above an 8, so I can assume there are no Etonians in our pants. The graph seems to show that less formal uniforms are more popular – such as a certain coloured jumper, or a certain logo on a t-shirt/jumper. Personally, my primary school uniform (and my first secondary uniform) were probably both a 5, with my final uniform being around 7. (So for me, because I did answer my own survey, I picked 6). The other question I think should have gone here would have been one about whether or not people liked their school uniforms, but seeing as I only thought of it 10 minutes ago, it isn’t there. 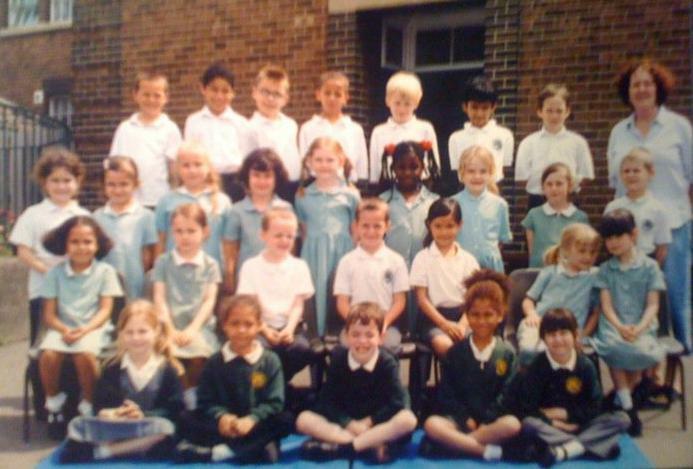 This is me and my primary school class, aged about 6. Don’t we look adorable? And smart. The uniform we wore back then, little grey pinafores (or green gingham summer dresses) and green cardigans, seems quite formal. That is, until I tell you about my primary school’s new uniform – which they brought in when my brother left a couple of years ago. Green Blazers, and ties. On 5 year olds. It looks quite cute, but I can’t help thinking how hideously impractical (and expensive) it must be. Question number 3 (of the ones being discussed here) was about how strictly uniforms were enforced/how much teachers cared about people’s uniform. 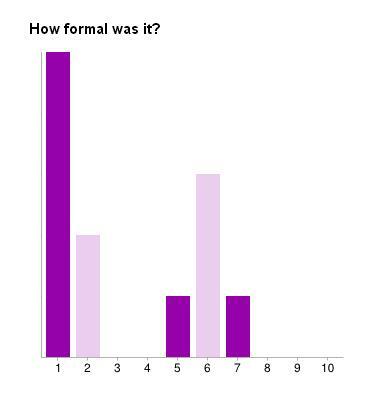 This purple bar chart shows that most peoples’ teachers care about uniform. Quite a lot; 42% voted for the top category – and of the people who had uniforms, only one of them had an optional uniform (and it were one of the less formal uniforms). Now for an anecdote of my second (school) uniform. This is my religious ed. class, from year 10 (9th grade). We all look pretty scruffy. Because my school was once a separate boys school and girls school (they merged in the late 60’s), the boys and girls had slightly different uniforms. Notably, the boys couldn’t wear jumpers. This meant that whenever I was walking along the hall with one of my male friends, there’d be a yell of “Tuck that shirt in”.And begrudgingly, he’d do so. But me, having a long jumper, I never did. As it’s the way all exams finish, the survey finished with a long answer question on whether or not there should be school uniforms. The gist of the results is in another lovely purple pie chart up here. 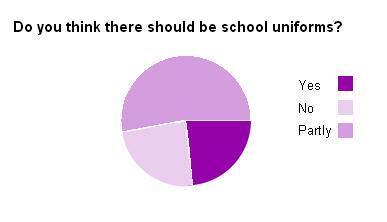 Only 24% of people disagreed with uniforms outright, with the majority (53%) having some sort of mixed opinion. The main reasons people gave for disliking the idea of uniforms were to do with civil liberties/ freedom of expression and cost. Someone also said something about different uniform standards for boys and girls, which I touched upon earlier. The main reason I would disagree with uniforms, at least with my uniform, would be because it was pink. Also, because they changed the uniform at the start of my last year, it was really expensive for just the 7 months or so that I actually wore it. My little brother wears it now though, and you can’t really do those sorts of hand-me-downs with normal clothes. As for the people promoting uniforms, again it was 24% with a decisive answer, their reasons were somewhat more varied. People mentioned bullying – both for reasons of not being able to afford fashionable clothes, and for reasons about being judged for “bad taste” or unflattering clothing. (Whereas if you have a school uniform like my 3rd one, shown above, everyone looks ridiculous). People also mentioned how school uniforms are easier, there are far fewer decisions about what to wear, and how wearing a uniform prepares people for the modesty required by the working world. Or as someone very neatly put it, “it helps people understand that you have to dress for what you’re going to do. There seems to be a harsh reality check that people slam into when they start to work and realize that they can’t wear their pajamas for the rest of their lives”.